Wait, there *wasn’t* an Avengers team for a while? That’s… hard to believe, especially with the Avengers property remaining the cornerstone of Marvel Comics publishing, but that’s the status quo our story seems to be starting with, so let’s see where it goes. Or, actually, the real start was one of their heroes shouting “You’re a JERK!” at another one. Wow. Such an auspicious beginning. But that was just the teaser, as it were. The remainder of the main is about how the team will be forming from “nothing.” Not even an Avengers Tower, which is being dismantled after some supposed money problems from don’t-worry-he’s-still-rich Tony Stark. He’s just not RICH-rich, you see. Nevertheless, it’s the scene of a casual encounter between him, Captain America, and Spider-Man Jr. versus the giant alien Warbringer. Before that can be resolved, the issue is broken into a second half that features a completely separate casual encoutner between Ms. Marvel and Nova. The resultant shift between the two parts is a bit disappointing, with two different reading experiences instead of one. I can understand an artist shift may necessitate a distinct split betweent the A story and the B story; maybe it was impossible to allow one part to be a subplot for a main story that spreads across all 21 pages. But when it’s an already-fragmented narrative that features characters who are not even on a team at this point, it’s hard to read this as an “Avengers” story, let alone one that’s meant to be a replacement for the Avengers to the lay Marvel universe citizen. Instead, it’s got the feel of an anthology. A done-in-one set-up, or even something a bit more en media res than a single page of name-calling, may have felt more substantial. Of course, Waid and Kubert are master storytellers, although there are a couple of things that are of mixed success. Some are minor, like the dialogue of a crowd messing with the flow when reading the main characters’ interactions. Others are a bit more serious, like not understanding the full import of the man who apparently owns the former Avengers Tower now. There’s some strange display of power and some shifting camera angles that leave a lot to interpretation rather than being clear. It’s one thing to be mysterious and another to be too obtuse to realize you’re trying to be mysterious. The art of Mahmud Asrar in the second half has some staging problems as well, but this time due to the size-changing nature of Ms. Marvel’s powers. It creates some awkward sequences where Ms. Marvel is the focal point, making everyone else appear like they’ve shrunk, and the lack of backgrounds remove all context, leaving the reader nothing to reference. The strength, though, is certainly in the expressive emoting from our characters, a clear weakness in Kubert’s offering in the first half. What’s interesting is how branding really does affect the the impression of the contents. Calling it All-New All-Different Avengers means you are entering the comic with a set of expectations, an anticipation of a certain kind of flavour. Imagine, for example, if this comicbook was titled Young Avengers instead. Wouldn’t the expectation change, and actually enhance the reading? What we got now makes me wonder why Spider-Man Jr., Ms. Marvel and Nova are getting in the way of reading about Captain America and Iron Man. I have no problems with Cap and I-Man getting in the way of reading about the three youth, but that’s just me. I’m sure Waid is aware of this, but we’re talking about significant age gaps that will necessitate a particular kind of interaction. There’s a reason why people tend to read teams of all teens OR of all grown-ups. Perhaps having a blend of the two is the real All-Different experiment that’s going to play out here. It’s a very serviceable story, but it’s shooting itself in the foot with certain choices, most notable of which is to divide the book in half as if it’s an anthology of stories before the team is even fully formed. The art has some hits or misses, and the main villain Warbringer is less significant than a mystery man, but there’s not enough time to develop either beyond vagueness and/or cliché. We have yet to see the team truly interact beyond just Captain America and Iron Man, so it’s difficult to see who the breakout star or the point-of-view character is meant to be. Because the voices are so strong and the interactions are poised to be intriguing, I’ll continue to give it a shot, but things will have to feel more cohesive and more meaningful to be worthy of the “Avengers” title. This review was originally published for weeklycomicbookreview.com. Be sure to check in there for the world’s best comic book reviews! Buy your comics at Comixology.com or use Comicshoplocator.com to find a local shop near you! Apparently, “more” is more for this issue. We have a new status quo, a new base of operations, two mysterious villains, an away team plus a home team plus a S.H.I.E.L.D. inspection team. Not to mention that the team in the field has a special jet, an array of powers among them, and several gadgets for even *more* powers for each. They face a threat that takes over 90% of the population of France and is both scientific and spiritual in nature, and one of their foes on the last page cliffhanger is made up of a crystal, a gorilla, a giant spider and a scorpion. You could dial this thing down several notches and still be overwhelmed. It’s so In-Your-Face that your eyeballs and mouth will blow back with the force of wind tunnel. But do I say that as a bad thing or a good thing? The energy to the book also comes from the expressive art from Gerardo Sandoval, which could definitely be described as capital-b Bold. The design has a block, wedgey aesthetic that relies on solid masses of shape rendered by heavy black areas, so characters appear bulky but lithe. The colorist picks up on this, shading characters and scenes with similarly blocky areas of solid colors. Often, this reduces a character’s expression, unless it’s Squirrel Girl, who appears as big-eyed as any cliché anime girl. Also, the art really over-emphasizes hands, making them exaggerated and out of proportion. Such complexity and energy makes some panels hard to register at a glance, but nevertheless the flow is clear overall and there’s no problem with continuity of storytelling. Instead, it’s the sheer amount of set-up that’s overwhelming. That gives a nice energy, and certainly amps up the high “weirdness factor.” It’s at the sacrifice of some smaller moments and there’s no chance to catch a breath— all flow and no ebb. I’m not sure I can criticize that too much as it’s clearly full of necessary exposition and all used to set up our tone/flavor to the series. In the past, I have criticized Ewing’s Mighty Avengers title for having a huge cast and yet only giving a few players any focus. Here we have the opposite, for sure. I’m hoping for a balance between such extremes as the series continues. I’m intrigued by allowing characters like Songbird coming into focus. I’ve always enjoyed the new Power Man and White Tiger. I want to see the new A.I.M. status quo and how a cocky Sunspot can manage things that frankly should be over his head. I’m concerned that Squirrel Girl will be nothing more than device for some kind of humor, and that Hawkeye won’t return to the competent but flawed hero he was as leader of the West Coast Avengers or Thunderbolts. I’m also wondering if things aren’t been pushed into “strangeness” a little bit too quickly. So far I’m associating Al Ewing, and even these choice of characters (with the exception of Squirrel Girl), as pretty serious, maybe even “street-level,” types of stories that, at best, have dealt with a pretty typical superheroic milieu. Here, I’m picking up associations of Keith Giffen’s run on Doom Patrol, whose base was Oolong Island, a haven of former mad scientists. For such a quirky team, that seemed to work more naturally. Time will tell if such an extreme will work for New Avengers, or if it will get stuck in between classic tropes and quirky ones and fall flat somewhere in between. Kind of makes you appreciate the new Captain America series where the central framing device is simply surviving a flight in coach. So it’s a comic that wants to come out of the gate running, and it does so… at 100 miles per hour. There’s no denying the energy and momentum of the storytelling, made more dynamic by bold artwork and crowded panels. To make it happen, the comic relies more on the set-up with few opportunities for reflective moments or deep characterization, but even at least with the surface-level stuff, the comic gives a bit of time for everyone, even the supporting characters. And, hey, if you can’t take a bold approach when taking a team into a bold new direction, then you would have missed the opportunity. I’m certainly on board to see how this goes. Have you ever made a homebrew line-up of a superhero team? Everybody does. My personal history of fandom includes everything from scrawling various team-ups in my school notebook to playground debates, fan websites and fan art, role-playing game sessions, message boards posts, and, well, countless others ways. It’s a hallmark of being a fan. So something like Uncanny Avengers is both so obvious and so ingenious. Take a little bit from the Avengers and a little bit from the X-Men and mash ‘em up to see what happens? Brilliant! Fun! So why isn’t this comicbook either of those things? Remender’s run on this title’s first volume took advantage of the set up for some intriguing premises and interactions, not to mention great choices for villains. It even all led up to a company crossover event, AXIS. I have to admit, though, that there was still a big disconnect between the *theory* of the title and the actual practice. Now Gerry Duggan has a chance, together with Ryan Stegman. And it still can’t quite seem to get off the ground. This issue serves well as an introductory story. The team has a minor fight for a kind of “cold open” then splits up and has some exposition with each other to help round out our status quo, until a new villain appears and the team assembles so the villain can pose dramatically on the last page. 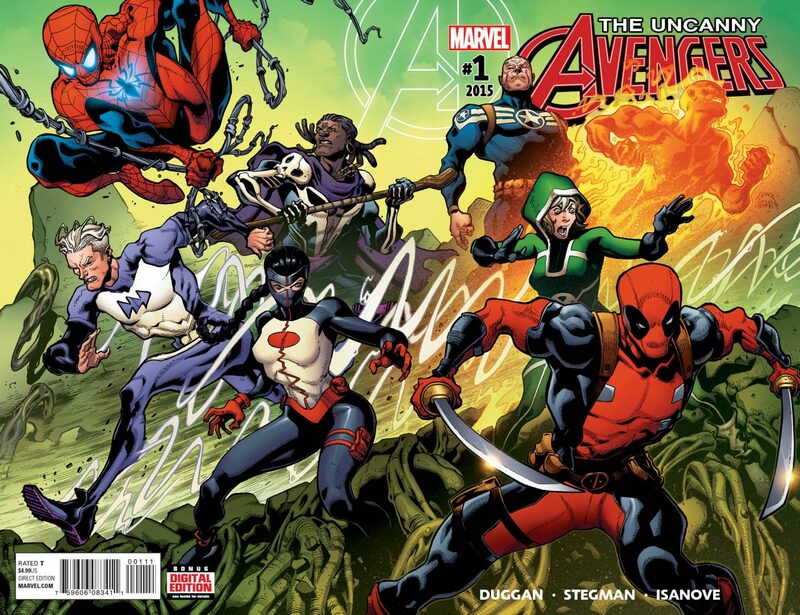 All of that is well and good, except there’s a new complication to the whole set-up of the Uncanny Avengers. It now has to deal with a third factor of the Marvel universe reality— the way the Inhumans are rising into prominence (and that’s both on a narrative level and as a publishing strategy.) On one hand, there’s my personal reaction to this, so for purposes of full disclosure I have to say that I never have nor do I foresee a time when I will enjoy Inhuman stories. Ever since reading in the late 80s, no Inhuman has ever made it into any of my homebrew fan-made line-ups. But personal reaction aside, it’s an element of confict seems to be forcing its way into something that already had inherent conflict. Instead of Avengers Vs. X-Men as the struggle implicitly behind the stories, character choices, and villains of Uncanny Avengers, now there’s … what? A complete left turn into a different territory. The previous tension is jettisoned, left unresolved. Not to mention the fact that it fractures the focus of the simple premise in the first place. None of the Avengers nor X-Men have any longstanding conflict with Inhumans, so there’s something artificial and tacked-on about the conflict that’s being presented here. The team should be Avengers and X-Men, but Rogue seems to be the only represtentative of the latter. No, I’m not counting Deadpool as an X-Men; he’s not even a mutant. Steve Rogers (does he have a codename anymore?) is the only kind-of Avenger. I’m not sure Spider-Man or Doctor Voodoo have really been entrenched enough to be considered in that league. Which leaves Psynapse— the Inhuman that now has to shoulder all of the narrative tension that’s been forced on the book. Both the character and the aformentioned tension are simply presented as givens. There’s no real introduction to either, nor are we allowed a point-of-view character to ease the readers into it all. The exposition that’s so necessary for a beginning issue is given by dialogue between Steve Rogers and Rogue, two characters who should know all of it already? More about Deadpool, whose justification is that not only is he “better” now— you know, morally— but that he can finance the team because of his lucrative business born of his popularity. I have no problem with Deadpool being popular with fans of comicbooks, but to have him so wholly embraced by the public at large within the comicbook just doesn’t seem right. Even if Deadpool were popular, I would hope it would be in the same sense that Donald Trump is popular… a loud and vocal fringe minority that all good and decent people tolerate, at best, as a joke. Maybe I’m just too optimistic and have too much faith in humanity, even ficitional ones. And thus, I appreciate the whole exchange with Spider-Man, who leaves the team rather than work with someone like Deadpool. And why I think Steve Rogers seems entirely out of character and in the wrong voice to defend him, at least in such a public way/extent. Which is a shame, since I think Rogue seems way more competant and strong (in terms of character) than before. I would love to see this Rogue continue to grow in this surprisingly new way, but I’m not sure I’m going to be able to stick around that long. Whew! All of this and I haven’t even been able to comment on the art! While I appreciate the energy and boldness of the art, it’s just way too distorted to handle the tone and flavor of this series. In a Deadpool-only book, or heck, even in a Spider-Man solo, this might be fine. The exaggeration and kinetic frenzy would fit well. In a comicbook that’s already off balance, however, it only adds to the tension, making it off-putting. As much as I loved the opportunity afforded by the premise of an Uncanny Avengers in ideal, this comic falls far short of that. It doesn’t feel either Uncanny nor Avengery, from the choice of characters, their voice and interaction, and even in the artistic aesthetic. For an introductory issue, there’s a pretty basic set-up here, but even still it misses opportunities to present new characters and the status quo in an engaging way to really draw me in as a reader. One is a sassy superspy with high-flying kicks and the full weight of an international agency behind her! The other is a grim vigilante gunning down all criminals with singleminded purpose for his personal agenda! Marvel Entertainment has released a new direct-to-DVD animated feature with help from Sony Pictures Entertainment Japan. I had no idea this was even a thing, so imagine my surprise when I stumbled onto in and found it available in iTunes. You know me and superhero animated movies! Let’s see how it holds up! No spoilers here, necessarily, but you never know. I’ll make a second post tomorrow with some things that I really want to talk about that HAVE to include some pretty significant spoilers. I’m putting the head’s up here so you can, you know, actually watch the film untainted, like I did. You’ll be surprised about some of the cameos from Marvel Comics’ larger universe and, I’ll just say at this point that yes, the Avengers (minus Captain America) do show up for the big battle at the end. So maybe talk about the production here? The film was made by Madhouse, a Japanese animation studio, whose credits include Ninja Scroll, Vampire Hunter D: Bloodlust, and Death Note. So by that token, Avengers Confidential fits their house style quite nicely, even with a quite noticeable lack of gratuitous blood during the quite violent fight scenes. 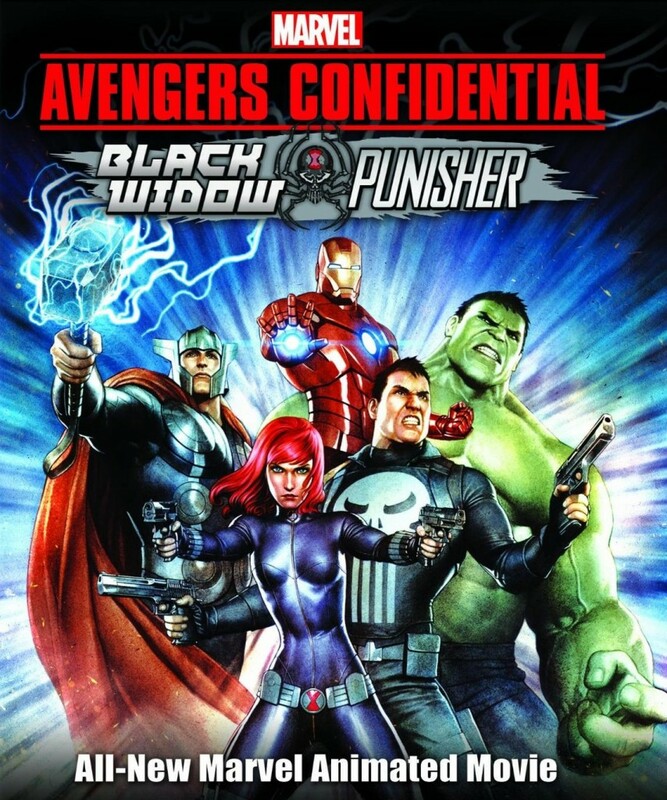 Apparently, this wasn’t the first collaboration between Marvel/Sony and Madhouse; they also produced a series of series with different Marvel characters in Japan (Iron Man, Wolverine, X-Men, Blade) during 2010 – 2012. Back to the film. When there is action, the scenes are pretty lively, of course. Black Widow and Punisher are given the opportunity to fight each other three times, and fight alongside each other twice, which is perhaps the appropriate ratio for a Marvel story. The Widow gets a number of interesting moves, but it looks like the animators quickly run out of tricks when her fighting style is basically flips and kicks and shooting sparkly needles. The Punisher does more firefights than straight-up fights, aptly enough, and they’re usually covered with sound effects and lighting tricks to amp the excitement of a man just standing there firing guns. To compete in the drinking game, watch for those cliches of a character running with his hands pointed straight to the ground, the slo-in/slo-outs whenever a character does a different, more dramatic move, and the quick feints accompanied by grunts and zip-pans. It’s all slickly done and with high production value, but pretty standard stuff all around. The plot follows that “pretty standard stuff,” model, too. It’s exposition, then travel to a new location for a fight; more exposition, more travel to a fight; lather, rinse, repeat. It’s kind of a video game model, where the characters move steadily closer to the Boss Level for the final showdown. And the exposition parts feel LONG. Along the way, there’s a kind of love-story for Black Widow that feels forced because it only starts at the end of Act Two, but the pathos is only ratcheted up in Act Four. There’s no truly surprising reveal or twist, nor any true conflict or change in the characters. Maybe that’s why the love-story for the Widow feels pretty hollow– there’s nothing to really develop so ultimately it’s all kind of meaningless. The Punisher is still the grim, single-minded vigilante he started as, and the Black Widow is still… uhm, working for SHIELD? There are a few moments when there’s a hint at conflict between the two. The Punisher’s mission is cast in a pretty selfish light, after all, at least when the Widow is cast as a “company person” following SHIELD’s mission parameters. As you might expect from every movie trope ever, the Widow has to break from the company line and come over to the Punisher’s side in order to see the mission through. However, there is never a big deal made about this, either by the character herself or even from her boss who pretty much seems to sanction it all anyway, so the script is really just going through the checklist on its video-game model of storytelling. The climactic battle is fun to watch, of course, and the studios break out a bit of computer-assisted scene building to help make the scale as large as possible. The Avengers (with some interesting cameos!) are brought in to assist, and by that I mean, participate in some background action so that the title characters can have a dedicated toe-to-toe with the Boss Level. It’s enough to keep any attention-deficit viewer engaged, but on reflection, again, we don’t really see anything very creative in the battle– it’s either shooting or punching. The Cameo-Avengers are given a couple of spotlighted sequences, but ultimately don’t do much, and don’t even have any lines, letting Iron Man make all the Tony Snark that you’d expect, which really isn’t that funny anymore. Overall, on the scale of Nay, Meh, or Yay, this is decidedly a Meh. I enjoyed the film mildly, mostly in an ironic way, and yes, you wouldn’t be the first to call me hipster. Others with less tolerance for 80s-style anime and/or story tropes will not enjoy this at all, while anime enthusiasts will find this a comfortable warm blanket.